Create eerie “OOoooEEeeuuuu…” sounds with your mouse. Imitate the eerie tones of the theremin. Wave your mouse to create cool sounds,similar to the musical instrument known as a Theremin. One axis of movement alters pitch, and the other controls volume. Controls allow changing Wav parameters such as sampling rate and resolution. Now you can also record your performances direct to disk, in audio .wav and MIDI .mid formats. System Requirements: sound card with Wav support, >1meg disk space, Pentium or faster. Benefits of Registration: Most recent version, registration code for several updates, email support, email notification of version releases. Here is our technical support page. 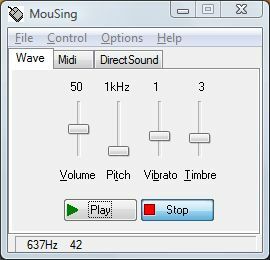 Do you have an interesting composition created with MouSing that is available on the Web? Send us your link! John Poultney, “Scare Your Pets”, Downloading Zone, Music & Computers,September 1997, pp71-2. David Nourse, “Digital music for the masses”, Shareware column, Australian Personal Computer, June 1996.